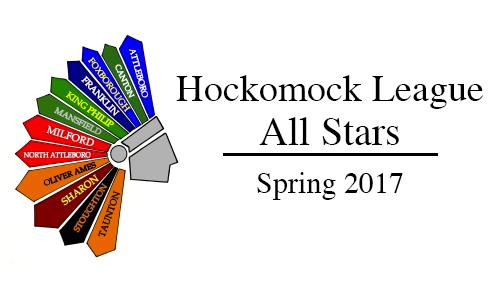 Below are the official 2017 Hockomock League Girls Lacrosse All Stars, selected by the coaches in the league. For a history of recent Hockomock League Girls Lacrosse All Stars, check out our history section. Attleboro is still a relatively young program but has taken strides to be competitive with the rest of the teams in the Hockomock and first-year head coach Kevin Patton is hopeful that the large number of players at tryouts is a sign that the Bombardiers are heading in the right direction. One of the reasons for Attleboro’s confidence coming into the spring is the experienced players that will take the field, including senior Mish Logie, who is a four-year varsity midfielder. Joining Logie as a captain for this year’s team is goalie Hadley Porreca, who is in her second year in net. In addition. juniors Emily Patton and Ali Wall return in attack, while classmates Kim White and Graycen Cassidy will keep things tight on the defensive side of the ball. Midfield depth will be provided by sophomores Kyra Lyons and Alex Compton, who are both coming off strong rookie seasons on varsity. Freshman Sydney DiLiddo will also have the chance to step in and contribute in midfield this season and junior Ashlyn Salisbury and sophomore Shea Harrison will see time on defense. Canton won five of its final seven games last season to get back to .500 and qualify for the state tournament and the Bulldogs will be hoping to carry that momentum over to this spring with a roster that features nine seniors and eight juniors. Some of the key returning players for Canton this season include senior attacker Mary Kent, senior defender Tessa Cudmore, and senior goalie Kathryn Doody, who form a solid spine for the Bulldogs to build on. Caroline Hagan, Rebecca Eckler, and Maria Mackie are among the other seniors that will be contributing for Canton. One of the younger players to watch is sophomore attacker Leah McClellan, who is one of several players that helped the girls’ hockey team reach the state title game at the TD Garden. Another sophomore, Maggie Malloy, has already had strong seasons for the field hockey and ice hockey teams and will provide depth this spring. Foxboro won its fifth straight Davenport division title last spring and returned to the Div. 2 South semifinal for the second straight season and expectations will be even higher this season for head coach Brittany Sherry, as the Warriors return 15 players to try and make it six league titles in a row. Among the many experienced players coming back is an exciting core of sophomores that have made instant impacts, including the reigning HockomockSports.com Underclassman of the Year Sophia DiCenso, who scored 65 goals and had 31 assists last year. Joining DiCenso up front will be classmates Caroline McGeary and Meghan Curran and juniors Jackie Brion and Catherine Luciano. Defensively, senior Hallie Canfield will be back to anchor things and provide leadership. Junior Christina Rogers and sophomores Jenna Stamatov and Molly Murphy will also be back to limit opposing offenses. Freshman Sara Addeche will take over in goal and is another in a line of talented underclassmen that Sherry is excited to see develop over the course of the season. Another spring and another league title for Franklin, which completed another perfect season in the Hockomock and then carried that success into the playoffs to win a second Div. 1 East title with a dramatic, one-goal victory over Acton-Boxboro. Even though they only return five players, the Panthers enter the season as the favorite in the Kelley-Rex division and with sights set on challenging for a state title. There is experience coming back for the Panthers with seniors Grace McDermott and Dana Lewandowski coming back to control things on the defensive end, while former Underclassman of the Year Kendall Reardon and fellow senior Caroline Lounsbury will provide leadership in the attack. Franklin always seems to have players ready to step in and, despite there being a youth movement on the varsity team, the Panthers have already started 2-0 with wins against Needham and Lincoln-Sudbury. Sophomore midfielder Annie Walsh and her freshman sister Erin have both gotten off to strong starts with sophomore Halle Atkinson helping out with a hat trick in the win over L-S as well. King Philip surprised some last spring when the Warriors went on the road to beat Westford Academy in the first round of the Div. 1 East tournament and that experience could pay dividends as KP returns a number of key players with the intent making a run at earning a first league title since 2012. Senior Angela Vellante is back and head coach Julie Boudreau called her the “quarterback” for the attacking unit. Vellante will be looking to feed junior Katie Crowther, who was the team’s and the league’s leading scorer as a sophomore with 111 points. Senior Meghan Wagner was a starter as a freshman and scored in every game but missed the last two years with an injury and is now back to make an impact on offense. KP can also count on a strong sophomore class led by a core of midfielders: Caroline Klim, Alli Meehan, Victoria and Olivia Tormey, and Dana Truini. Also back is sophomore goalie Caroline Watson behind a defense of juniors Molly Mullins, Christina Hathaway and Izzy Agricola. Also making a return is assistant coach Mary Pasquantonio, Boudreau’s sister, who brings experience as a former KP player and will help the current crop of Warriors on draw controls. Mansfield won its opening two games of the 2016 season, but the Hornets struggled during a difficult middle part of the spring and missed out on the state tournament. The Hornets showed flashes of potential during the year, including a close loss to perennial tournament team Hingham, and hopes are high that they can get back into the postseason this year. Expectations are boosted by the return of a strong core of experience players. Senior Maire Foley will be a focal point of the Hornets attack this year, while classmate Maggie Dunn and junior Ann Maher will return in the midfield. Senior Jen McCabe will provide leadership in defense and sophomore Kaity Garvin will build off her rookie season in attack. It has been a tough run for Milford since moving to the Hockomock League, but the Hawks bring back an experienced roster for first-year head coach Tim Dowd and he is hopeful that the program will continue to improve over the course of the season. Dowd’s excitement for the new season is in part built on the leadership of his senior class, including captains Taylor Dube, Jill Burley, and Jordyn Lombardo, who Dowd said would all have “incredible seasons.” He praised all three for their competitive spirits and for pushing their teammates to improve. Another senior, Brainna Croteau, will be in charge of the defensive unit and Dowd is counting on the development of a talented group of sophomores and juniors. Milford also has two freshmen, Hannah Bangert and Anne Flanagan, who will be on the varsity roster this season and who Dowd thinks will make an impact. Under first-year head coach Mike Vitelli (who had previously led King Philip to a Hockomock League title and a South final), North Attleboro made a jump into second place in the Kelley-Rex division and won 13 games, while reaching the playoffs for the first time. After a loss to eventual state champ Walpole, Vitelli has built up North’s schedule with perennial powers Notre Dame Academy, Natick, and Walpole to get the Rocketeers prepared for a tournament run. North will clearly miss last year’s Player of the Year Hana Caster (who is now at UMass Lowell), the Rocketeers return a number of important players, including six of the team’s seven defenders. Seniors Samantha Taggart, Emily Schromm, Emma Cromidas, and Alaina Mello will provide an experienced defensive unit in front of junior goalie Kayla Moulin, who Vitelli believes will have a great season. Up front, North will turn to junior Kenzie Rosenberg and senior Erin Holley, who had breakout seasons for the Rocketeers in 2016. Chloe Olsen, Julia Dakin, and Julia Tolfa will also be counted on to provide offense for North Attleboro, while Camille Pizzaro and freshman Katie Lindstrom will be newcomers to watch this spring. Oliver Ames reached the postseason last year by finishing second in the Davenport division and will look to build on that in 2017 in the Tigers first season in the Kelley-Rex and first season under new head coach Abby Tepper, who is only one year removed from the end of a very successful college playing career at Salve Regina and a solid first season as coach of the OA field hockey program this fall. Tepper inherits a roster with several key returning players that provide a foundation for the Tigers, who won the opening two games of the spring. Junior captain Sofia Masciarelli will be the main attacking cog for OA this season with senior Katie Davenport back in the heart of the defense and junior goalie Ari Waldorf will be back between the pipes. Also back for OA and expected to make a step up into the starting lineup are senior captain Kendall Clifford in the midfield, junior Chloe Kilkelly in the attack, and sophomore midfielder Olivia Piazza. In her second season in charge, Sharon head coach Colleen Carchedi (née Manning) led the Eagles to their first ever playoff appearance. On their home grass, the Eagles put in a great performance to battle perennial playoff competitor Bishop Feehan and the experience has generated a lot of excitement in the program as the new season begins. Sophomore Emma Eberhardt is another player coming back that Carchedi believes will be able to take on a much larger role this spring. Eberhardt will add size in the midfield and, particularly, on draw controls. Carchedi said, “She is an all around stud athlete and is for sure a player to watch.” Sophomore Rose Wald is a newcomer that takes over in goal. With a win against Norton on Monday, Taunton avenged a pair of losses to the Lancers from 2016 and is halfway to last year’s win total. The Tigers are still a young program at the varsity level and, as such, head coach Kerry Northup knows there will be a learning curve against Hockomock opponents, but she is also excited about the team’s potential. The Tigers will turn to seniors Delaney Powell, Annie Tate, and Abbey Kingman to provide consistent offense this spring and all three had big games in the opener against Norton, combining for 12 of the team’s 17 goals. Powell led the way with six goals in the win and junior Lorna Li had 12 saves in another strong performance for the Tigers’ “confident” goalie. Taunton also has plenty of youth that will be gaining valuable experience this spring, including three sophomores, a pair of freshmen, and three eighth graders. One of the eighth graders, Alana Tavares, made the most of her varsity debut on Monday, potting five goals against Norton and will be one of the newcomers to watch in the Hock this season. SHARON, Mass. – On Wednesday afternoon, the Sharon girls’ lacrosse program made a giant step forward, one that was promised in the preseason, when the Eagles hosted Bishop Feehan for their first ever tournament game. Rather than just being happy with experience the playoffs for the first time, the Eagles set about pushing the Shamrocks (who beat Sharon 18-1 in the regular season), trailing by just two at halftime on their home grass (although Feehan was the higher seed, the game was played at Sharon High because of graduation preparations at McGrath Stadium). Feehan turned things around with a 7-0 run after the break and held off a late charge to win 13-7 and advance to the second round of the Div. 1 East bracket, but after the game the Sharon players huddled together with smiles on their faces knowing that it was an impressive display and a historic moment for the program. Sharon coach Colleen Manning raved, “It’s just something that they really looked forward to and something they’ve never really experienced before, but I’m sure if you ask them they’re just thrilled to be here. 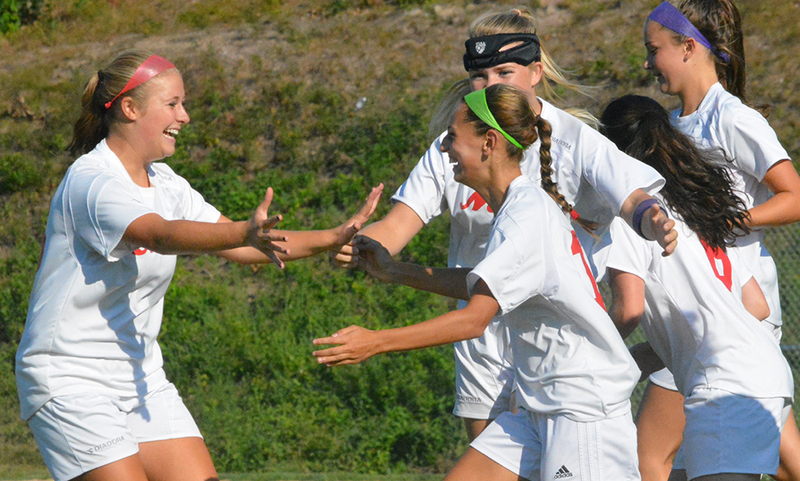 Feehan was the heavy favorite coming into the tournament game and jumped in front with a pair of early goals. Sharon would not let the game get away from it and junior Alex Rabb cut in from the left and scored the Eagles first postseason goal to slice the lead in half. The Shamrocks answered back with three straight goals to take a 5-1 lead with 6:01 remaining in the half, forcing Manning to take a timeout. Although Feehan had pushed its lead to four, the visitors were having to work hard to get past the Sharon defense, which was crashing the middle and preventing clean looks. Sophomore goalie Kathryn Derry made several big stops and Alexandra Miller, Amanda Kaplan, Anna Crosby, Seggelin and others combined to stymie the Shamrocks potent attack. Sharon had struggled to create scoring opportunities for most of the half but as the clock was winding down inside two minutes, Sabrina Robbins found space in the middle to score her first. With seven seconds left in the half, Emma Eberhardt was given a chance from eight meters and put it away to close the gap to two at the break. Seggelin said about the halftime team talk, “We were talking about how excited we were and how proud we were to make it this far and we wanted to keep up the aggression. The Shamrocks stormed out of the gate to start the second half and imposed themselves on the Eagles, scoring three goals in the opening couple minutes for an 8-3 lead. 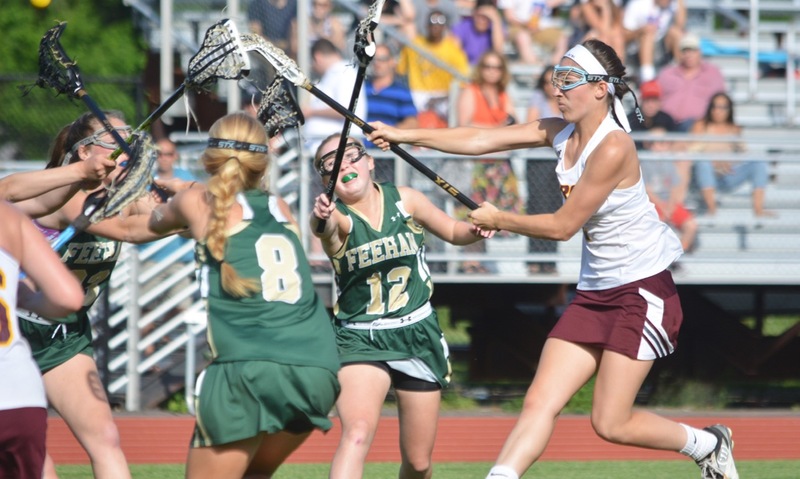 Feehan extended the lead to as many as nine with seven straight goals in the second half until Robbins tallied her second of the game with 8:05 left. “They had a lot of rebounds that they got, which I feel like we should have gotten them, but they worked so hard and we’re slowly climbing the ladder, so we’re getting there,” said Manning. The Eagles closed the game with momentum. Rabb scored in traffic and then just seconds later off the ensuing face-off she added a third to make it 12-6. Rabb scored her fourth of the game rom eight meters and the lead was back down to five with just 1:55 on the clock. Coming into the season, Manning made it clear that she had high expectations for the Eagles and that the playoffs were a legitimate goal. This was a clear change in attitude from the first 15 years of the program and Seggelin said that the team started to buy in after some early season wins. Manning is also hopeful that the playoff experience can lift the program to even greater achievements. “It makes everyone happy and having fun is obviously one of the most important things,” she said. “They just keep improving. I see it in every practice. SHARON, Mass. 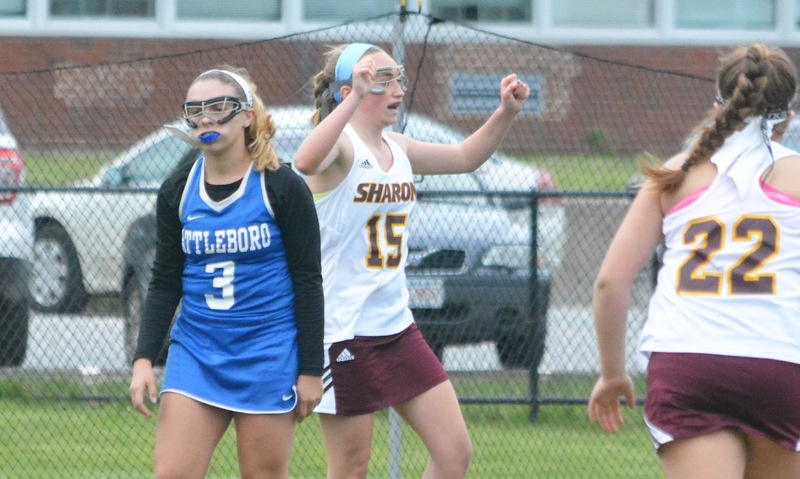 – In the past couple seasons, Attleboro and Sharon have been in a number of close games, including a one-goal victory for the Eagles in the first meeting this year, and Friday afternoon overtime was needed (for the second time in two years) to decide a winner. Attleboro senior goalie Amy Cadle made two big saves in the sudden death period to keep the Bombardiers in the game but in the final minute of the second OT, her outlet pass was intercepted by Anna Crosby and the junior midfielder raced in alone to score the game-winning goal. Crosby’s heads-up steal and goal lifted Sharon to a 10-9 win that pushed the Eagles back above .500 on the season and secured a season sweep of the Bombardiers. Attleboro coach Jackie Beland was left shaking her head at the end of the game after a second close loss to Sharon this spring. The Bombardiers were shorthanded on Friday, missing four attackers for the non-league contest, and Beland praised the team’s effort. “We just couldn’t pull through the shots that we want,” said Beland, “but the kids gave everything they had and we’ve been fighting through a lot of adversity this season with injuries and kids not around for the games. 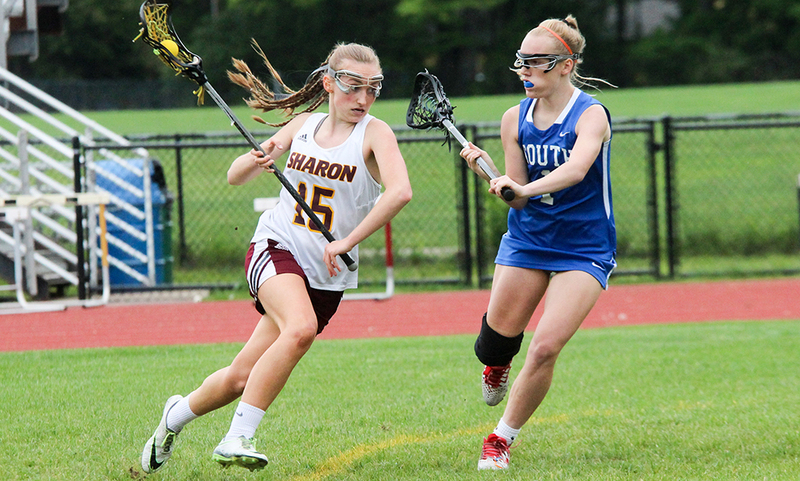 Sharon junior attacker Alex Rabb scored the first three goals of the game for the Eagles with freshman Kyra Lyons getting one back for the Bombardiers. Rabb would finish with six goals in the game. Meg Dotzenrod scored from eight meters to cut the lead back to one, but Crosby answered by winning the next draw and driving straight down the middle for the first of her three goals. Attleboro got one back before the break on a lefty shot bounced into the corner by Hannah Lamothe but Sharon goalie Kathryn Derry (10 saves) preserved the 4-3 lead with a big save on Lamothe seconds later. Derry started the second half with another save on Lamothe and the ball quickly transitioned forward to Rabb for her fourth goal of the game. Seventeen seconds later, Crosby pushed the lead to 6-3 after winning the draw control (Sharon won 13-of-21 draws) and again racing straight down the middle. Beland called timeout to settle the team down. The talk worked, as the Bombardiers would score the next four goals over a stretch of 2:24 to take their first lead of the game. Junior Mish Logie was left wide open in the middle and Dotzenrod picked her out on the edge of the crease to make it 6-4. Dotzenrod followed that with a free position goal and Lamothe scored in traffic, bouncing a shot in while falling to the ground, to tie it. Kayla Merritt put Attleboro in front with a head fake and spin move for a close-range finish. When Sharon needed a goal it turned to Rabb. 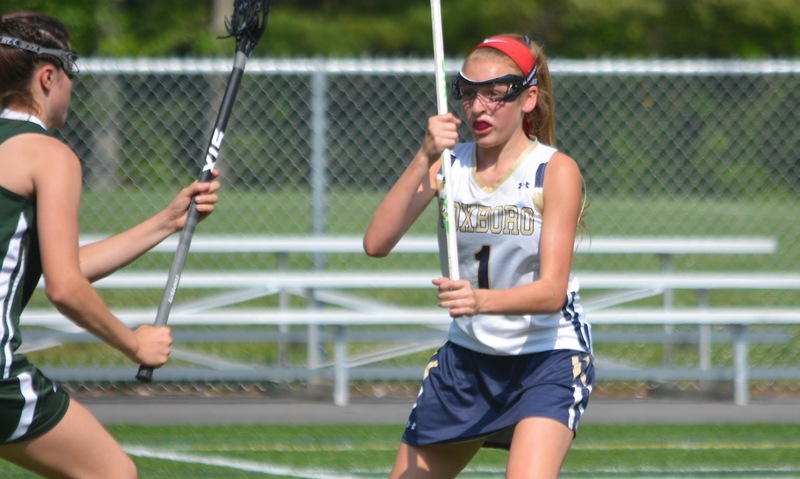 She scored on an eight-meter chance to tie the game at 7-7 and after Dotzenrod gave Attleboro back the lead with a man-down goal Rabb answered again with a goal in transition. Just 49 seconds after tying the game, Sharon took the lead. Senior midfielder Heather Seggelin went five-hole on an eight-meter chance to put the Eagles ahead 9-8. But, Attleboro had an answer with 6:09 to play, as Dotzenrod scored her fourth of the game with a nifty, low-angle backhand shot on a cut through the middle. The tension was ratcheted up a notch in the final six minutes as the teams tried to find a winning goal. Both teams had long spells of possession spurred on by their increasingly excited benches, but neither could find an opening. In the overtime period, Cadle (10 saves) was called into action inside the first minute to get a piece of a free position opportunity for Rabb. Derry then came right back with a big stop of her own on an eight-meter shot by Merritt. Just before the first OT period ended, Cadle again came through to prevent Crosby for winning it on a point-blank try. “She was phenomenal all game,” said Beland of Cadle. “She made adjustments in the second half and we tried to make adjustments on defense to take away their drives. With 56 seconds left to play, Cadle attempted to get the ball into transition but Crosby was quickest to the pass and turned it into a game-winner. Manning is hopeful that this type of win could be a huge boost for the Eagles’ playoff hunt. Sharon (6-5, 2-3) will host Norton on Monday, while Attleboro (5-8, 2-5) will host Oliver Ames on Wednesday.